Boasting a state-of-the-art modern design similar to a gondola, the Garlando G-2000 Grey Oak football table provides fantastic entertainment for home game rooms as well as schools and clubs. This sturdy football table features a lovely new grey oakwood finish, and a robust, dense MDF cabined coated with melamine for added resistance. The slanting legs share the same materials as the cabinet, and the table includes telescopic rods with non-rusting chrome plating. Also, the game flows very smoothly and stress-free thanks to roller bearings, whilst the plastic handles ensure an ergonomic grip. 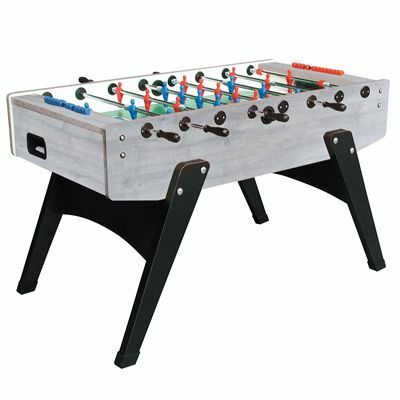 The table includes a set of distinctively coloured players (red/blue) moulded onto the bars, and there are fully-rotating goalkeepers to add a bit more fun and required playing skill. Furthermore, the table comes with ten white balls as a standard, and ensures easy ball recovery after scoring with a smart exit behind each goal. for submitting product information about Garlando G-2000 Grey Oak Football Table We aim to answer all questions within 2-3 days. for submitting product information about Garlando G-2000 Grey Oak Football Table. We aim to answer all questions within 2-3 days. If you provided your name and email address, we will email you as soon as the answer is published. for submitting product review about Garlando G-2000 Grey Oak Football Table.